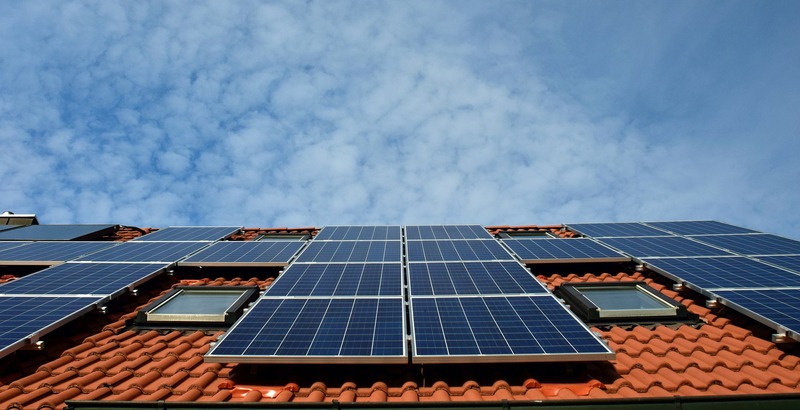 The Utah Division of Occupational and Professional Licensing issued a report March 20 in which state officials recommend revoking the license for Legend Solar, a solar energy company with headquarters in Washington City. The report also cited Legend Electric, Legend Energy and Legend Ventures, which are all other arms of Legend Solar. 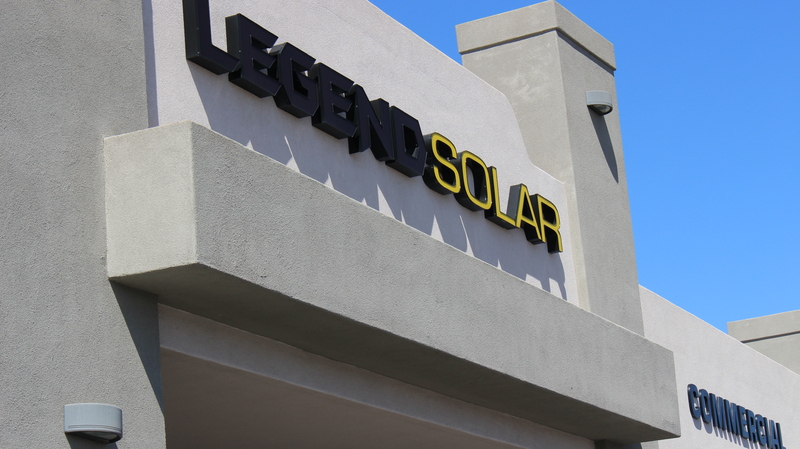 Legend Solar’s business licenses have been revoked in Nevada since August, where Legend Solar representatives reportedly never showed up to a financial responsibility hearing with the Nevada State Contractor’s Board. The company’s license is being investigated in Oregon as well. After being founded in 2012, Legend Solar reported a 400 percent growth in 2015 — from $3.7 million to $18.7 million — and was listed by Utah Business Magazine in its 2017 “40 under 40,” which honors successful entrepreneurs in Utah under the age of 40. Now, some of Legend Solar’s ex-employees and customers are attesting to the financial responsibility issues emerging from the company. Legend Solar’s main solar panel supplier, SunPower, has also started to refuse to sell panels to Legend Solar, citing expectations for its affiliates to show honesty in their business dealings in a statement. Cody Fullmer, Legend Solar’s former purchasing manager, told St. George News that he saw “a lot of deception and unethical behavior coming from the top management” of Legend Solar when he worked there. Fullmer said his job was to order solar panels and other equipment from suppliers. Problems from within the company started with “cashflow issues” when Legend Solar wasn’t able to keep up with paying vendors, Fullmer said. That caused supplies to be sent to out late, which slowed projects and made customers angry. Fullmer said he was laid off in October 2016 due to cutbacks at the company. He said many employees have also been laid off since then because of cutbacks and blame from the owners. The biggest reason Legend Solar has experienced so many problems with finances is because of the unchecked ego of its owners, Shaun Alldredge and Shane Perkins, Fullmer said. “They wanted wild growth within the company and just wanted it to happen without taking any responsibility,” Fullmer said. When Fullmer worked for the company, he said he was promised a raise if he hit certain benchmarks. But when it came time for his review, he said he was told Legend Solar didn’t have enough money to allow him to have the promised raise. At the same time, Fullmer said it bothered him that the owners were buying expensive new cars and taking “lavish” hunting trips around the world. Alldredge and Perkins made a $10 million donation to Dixie State University in April 2016, which was a payment Fullmer said the company could not afford to give at the time. 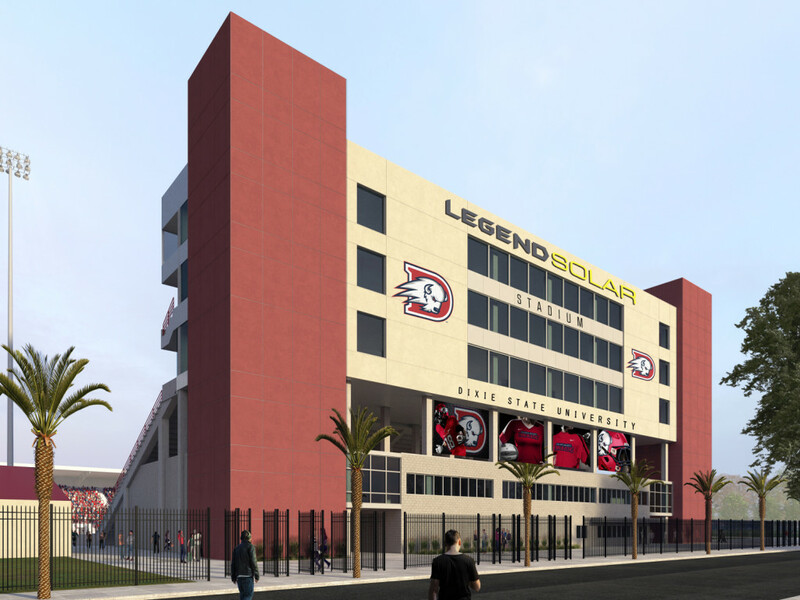 Dixie State announced earlier this month it would be removing Legend Solar’s name from the stadium and ending its relationship with the company. Jyl Hall, a Dixie State spokeswoman, said the university has not received any payments toward Legend Solar’s original $10 million donation since 2016. 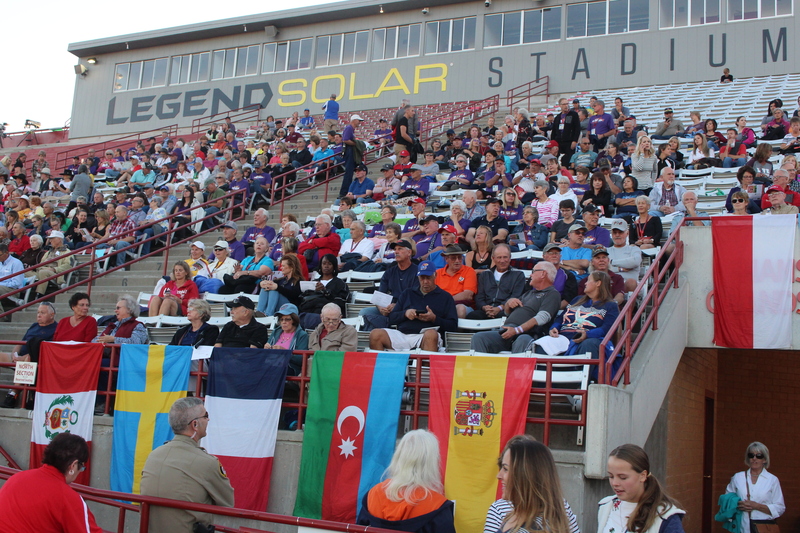 “Dixie State recognizes the need for Legend Solar to focus on their company and customers at this time, and once those responsibilities are taken care of and the company is on strong financial footing, the university would welcome the opportunity to discuss re-establishing the partnership,” Hall said in a statement. Jason Williams, a Legend Solar customer, said he signed a $24,000 contract with the company in April 2017 and struggled to get his solar system completed. Williams said Legend Solar delayed his project, installed refurbished parts that still do not function and has not yet refunded him for the faulty solar panel system. Williams said he doesn’t expect to be reimbursed anytime soon because of the current problems with the company. He has since had to employ a different Utah solar company, Solaroo, to complete the project Legend Solar started. A spokeswoman for Utah Attorney General Sean Reyes confirmed there were several complaints about Legend Solar from the St. George area, but could neither confirm nor deny an ongoing investigation by the attorney general’s office. In a statement on Legend Solar’s website in January, Legend Solar officials blamed Rocky Mountain Power for reducing incentives for solar customers and an “impending national solar panel tariff” that caused the company to experience the cashflow problems. We are committed to fulfilling all of our commitments to customers, but cannot provide a specific timeline at this time. We appreciate the patience of all awaiting action on our part as we work each day to remedy our cashflow needs. Resources to respond to customers, as well as other vital functions in the company, have been dramatically scaled back, resulting in delayed response times. Legend Solar co-owners Perkins and Alldredge have not responded to St. George News’ requests for comment about the allegations of unprofessionalism or the report by Utah Division of Occupational and Professional Licensing. A visit to the Legend Solar office building in Washington City Tuesday at 2 p.m. found the doors to the building locked and the parking lot mostly empty. According to state agency’s report, Legend Solar has 30 days since the mailing of the report to file a response to it before a final decision on Legend Solar’s license is made. Jennifer Bolton, a representative for the agency, said it has not received a response from Legend Solar. I think the line “Alldredge and Perkins made a $10 million donation to Dixie State University” should actually read “Alldredge and Perkins promised to make a $10 million donation to Dixie State University”. In reality I think they only made two payments of $150,000 (or possibly only totaling that much). In reality they may have hurt DSU rather than helped it, since DSU hasn’t had another headline sponsor on the stadium since then. The opportunity cost could realistically outweigh the money received being a net loss for DSU. That is a good point…probably will be a net loss to DSU. A minimum of 10% down would of been prudent. If that was the case, why hasn’t anybody filed a lawsuit against Legend Solar? There are lawsuits against this company. Creditors, customers and employees have all filed lawsuits. Got to love that legendary ‘suddern’ utah honesty, huh? In other words the entire company is a scam, and the owners ran it like a pyramid scheme. To not be investigated all they’d have to have done is grease Reyes and others with a nice little campaign contribution. They must have know the game well enough because they got away with it long enough. Maybe jeremy johnson was their personal mentor? Donald Trump could teach them a lot about bankruptcy protection! bad management, lies, encouragement to lie to customers, cutting of benefits, company running out of money, missing payroll, lies to employees about health of company…….chickens came home to roost. This company would have gone under years ago if Mountain America Credit Union didn’t enable their fraud by continuing to allow they do deposit checks and wires from customers when the credit union was well aware that Legend Solar had no intention of honor their promises. MACU didn’t want to lose the interest they were earning from Legend Solar so they ignored the calls from upset customers stop facilitating their operations. In the end, the owners of Legend Solar and MACU were operating together to make as much money as they could, as long as they could, with no regard for the community being scammed. They should all be held accountable for the damages. Legend Solar + Mountain America Credit Union = the perfect partners in fraud. Wow, I hope SunPower, their panel supplier, will back up their 20 year guarantee and that wasn’t just another come-on lie.